Allows improved thermal performance and smaller form factors. INTERNATIONAL Rectifier has introduced two 30V DirectFET MOSFET synchronous buck converter chip sets for laptop computer designs using Intel and AMD processors. They offer higher power density than traditional packaging options through the smaller package size. They also offer the ability to operate at high current levels using a single control and a single sync MOSFET. This allows the improved thermal performance and smaller form factors that are necessary for compact, battery-efficient, portable and mobile computing. Each chip set consists of a control MOSFET and a synchronous MOSFET. Each device is tailored to maximise performance in their role within a synchronous dc-dc buck converter circuit. Control MOSFETs have reduced switching losses, while synchronous MOSFETs have low conduction losses (low on-resistance), and low reverse-recovery charge. The IRF6617 control FET and IRF6611 synchronous FET are designed for optimum performance up to 20A per power channel in high density, space-restricted circuit boards. The IRF6637 control FET and IRF6678 synchronous FET are designed for increased thermal performance in applications requiring greater than 20A per power channel. The IRF6617 control FET is housed in a small can (ST) DirectFET package while the IRF6637 control FET is housed in the medium can (MP) DirectFET package. To enable an easy migration path for existing designs, both synchronous FETs are housed in the medium can (MX) DirectFET package, allowing a simple change from the IRF6611 to the IRF6678 when more current or increased thermal performance is desired. 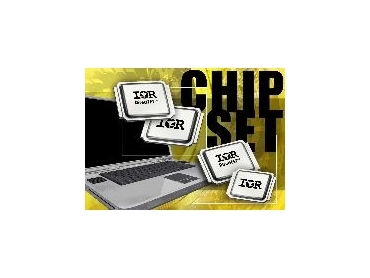 The chip sets also enable circuit designers to shrink high frequency, high-current dc-dc converters used to power high-end desktop computers and servers, as well as advanced telecom and datacom systems. Metal can construction enables dual-side cooling that effectively doubles the current handling capacity of high-frequency dc-dc buck converters powering advanced microprocessors. Devices in the DirectFET packages are lead and bromide-free.